Who knew when I packed my bags to move to Paris to study French cooking I would become a sausage fanatic? Considering that at the time I ate little meat, the thought of embracing all manners of sausages and charcuterie was an unlikely possibility. Yet, following my cooking program and culinary immersion in French cuisine (charcuterie is a French word, after all), a subsequent move to Switzerland (where sausage vies for popularity with chocolate) and meeting my Danish husband (who comes from a land where sausage carts are more prolific than Starbucks) my view of sausages understandably – and happily – shifted. Now, years later, sausage has worked its way into my cooking repertoire. It’s a staple ingredient in my kitchen and a hands down family favorite. Packed with protein and spice, sausages are a handy and flavorful addition to pastas, soups, stews and casseroles – when we are not gobbling them up straight off the grill. And to think that all it took was a trip to France. This recipe is perfect for an easy weeknight dinner. The seasoned sausage infuses the dish with smoky spiced flavor, requiring little additional seasoning, and since the sausage is pre-cooked, the entire dish may be prepared in 15 minutes. The ragout is delicious as is or spooned over couscous for a Mediterranean inspired meal. Heat oil in a large skillet over medium-high heat. Add the sausages and brown on both sides, turning once, about 2 minutes per side. Transfer with tongs or a slotted spoon to a plate lined with a paper towel. Pour off all but 1 tablespoon oil in the skillet and reduce heat to medium. Add the tomatoes and cook, stirring occasionally, 5 minutes. Add the chickpeas and garlic, and continue to cook, stirring occasionally, until tomatoes begin to collapse, 5 more minutes. Return the sausages to the skillet and add the cilantro. Cook until heated through, about 1 minute. Season with salt and black pepper to taste. Serve over couscous. For extra heat, add ½ teaspoon cayenne when adding the chickpeas. *Disclosure: This is a sponsored post. Hillshire Farm sponsored it and compensated me via a cash payment, gift, or something else of value to write it. Regardless, the opinions and thoughts are my own. Very tasty and wonderfully comforting! There are many good reasons to be a sausage fanatic! This dish is absolutely brilliant! I keep a stash of sausages in the freezer for making quick dinners. Pasta with whatever veggies I have on hand is the usual fare. 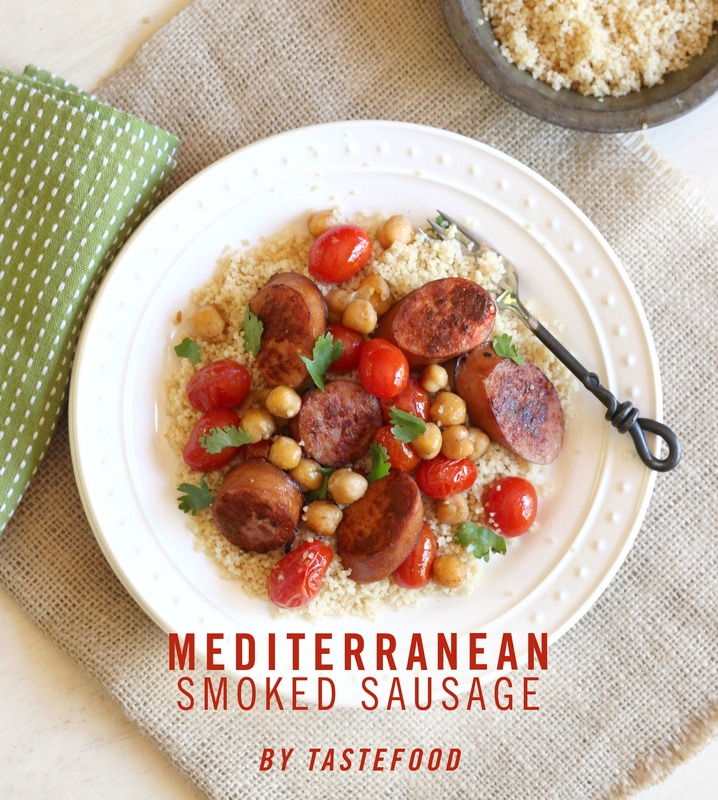 Paired with sausage, couscous and garbanzos would be a refreshing change at our dinner table! And squeeze some lemon juice over couscous! yumyum! I could live on this dish….yes I could.